0.43 mi🥘Bubba Gump Shrimp Co. 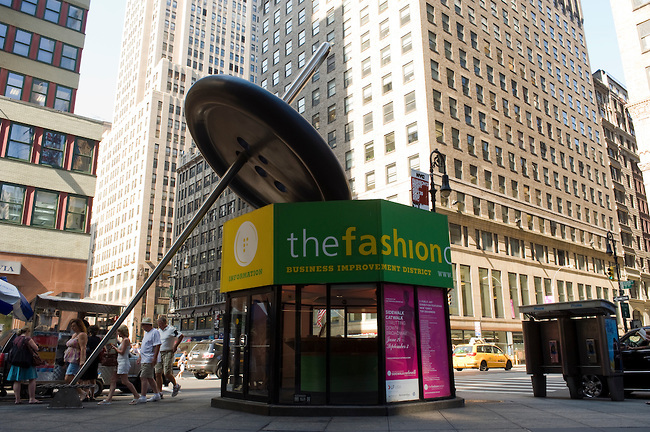 The Garment District is also called the Fashion District because of its impressive fashion industry that generates about $14 billion in sales annually. Naturally, it’s widely considered to be the fashion capital of the world. If you’re seeking affordable Midtown office space with plenty of public transportation options, the Garment District might be the right place for you and your business. The Garment District has nearly 48 million square feet of office space for rent, with another 7 million under construction. Its central location to several transit hubs makes it a convenient location to accommodate employees commuting from throughout the New York Metro. With an average asking rent of $65 per square foot, Garment District office space is some of the most affordable in Manhattan. More than 40 percent of available office space is in Class A buildings, with an average asking rent of $97 per square foot. However, Class B office space features asking rents of around $60 per square foot. The Garment District is less than one square mile in size and rests between Fifth Avenue and the Hudson River. Nearby neighborhoods and business districts include Hudson Yards, Times Square, Chelsea, Korea Town, and notable businesses in the area include Microsoft, The New York Times, R/GA, and the Boston Consulting Group. Despite its small size, the Garment District is home to more than 27,000 people. Travel quickly to and from Times Square and other popular destinations using one of the many transportation options for city and suburban residents. Convenient nearby transportation includes Penn Station, Grand Central Station, and Port Authority. Between these three transit hubs, commuters can access New Jersey Transit, Amtrak, Long Island Railroad, PATH, and Greyhound. In addition to these transit options, city residents can access the Garment District via the 1, 2, 3, 7, A, C, E, N, Q, R, and W trains. Because of its proximity to Times Square and Port Authority, Garment District has among the worst traffic in NYC and isn’t a particularly bike-friendly area. The Garment District includes plenty of apartment, hotel and restaurant choices. Looking for a delicious and convenient place for a business lunch event? Check out Casa Nonna, Ai Fiori, Savory and Parker & Quinn. The Garment District is widely known as the ultimate destination for designers, stylists, wholesale buyers, students and, of course, shoppers from all over the world. Calvin Klein, Donna Karan, Carolina Herrera, Liz Claiborne and Andrew Marc represent some of the top-notch fashion labels that have office space and production facilities in the district. Not only does the neighborhood attract those who work in the fashion industry—it’s also a popular destination for shoppers and tourists. As the Garment District’s name suggests, the neighborhood is an excellent place to shop for clothes and the materials to make them. Here are just a few of the most renowned places to shop in the Garment District: M&J Trimming, Louis Vuitton, Urban Outfitters, Mood Designer Fabrics and Lord & Taylor. The Garment District began influencing what people wear and how they obtain their clothing back in the 1800s. Middle-class Americans used to make their own clothing, and only rich people hired tailors to sew for them. During the Civil War, these tailors began collaborating to sew clothing in bulk for the soldiers. At the same time, skilled immigrants began moving to New York City, creating a labor force that could work in clothing factories. By 1910, approximately 70 percent of women’s clothing came from the Garment District. By 1931, the area boasted the most garment manufacturers of anywhere in the world. Today, the Garment District is known as the fashion capital of the world and offers a huge variety of niche resources such as dress dying services, full production cutting and wholesale fabric manufacturers—all within one square mile. The Garment District is a unique place to do business because it offers opportunities for fashion moguls, young entrepreneurs and recent immigrants alike.